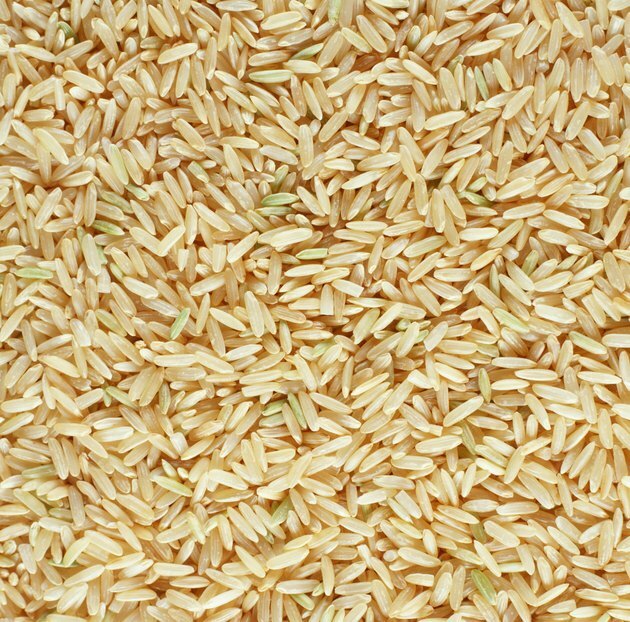 Whole-grain rice contains all three parts of the rice kernel: the germ, endosperm and bran. It’s often brown or darker in color and includes wild rice. Whole-grain rice is higher in fiber, minerals and vitamins than processed white rice, which only contains the starchy endosperm. Don’t despair if you are sensitive to gluten -- you can still have whole-grain rice, or any variety of rice for that matter. Just read the label to ensure it hasn’t been contaminated with gluten. Gluten is a grain-based protein found in rye, barley, wheat and any derivatives of these grains -- but not in rice. In general, gluten gets processed without a hitch. But if you’re allergic to gluten or have celiac disease, gluten causes your immune system to overreact. This inflammatory response damages your small intestine, causing diarrhea, gas, abdominal cramping and ultimately malnutrition, simply by consuming gluten. Rice fields are sometimes near wheat fields. When winds start blowing, some of the wheat -- and therefore gluten -- can blow over and contaminate the otherwise gluten-free rice crop. Or small animals can go from crop to crop, tracking along gluten fragments along the way. Growers and manufacturers, however, have to follow strict procedures to ensure that their rice crop remains gluten-free, such as keeping different crops a certain distance apart. Even if rice is certified gluten-free in the package, cross-contamination can happen at the store or in the kitchen. For example, if the naturally gluten-free whole-grain rice you purchased was stored below wheat flour at the grocers, that flour could fall onto the rice packaging. When you get it home, your countertops and anything that comes into contact with the rice box becomes contaminated with some gluten. Or if someone prepares your rice in a pot that was used to cook a wheat product without thoroughly washing it, your normally gluten-free rice becomes full of gluten. Always let your server know that you can’t have gluten when you go out to eat, just to be safe. While rice is naturally free of gluten, read the label carefully to ensure that there aren’t any ingredients, preservatives or contamination issues that may cause your favorite brand to have gluten. “Gluten-free,” “free of gluten,” “no gluten” and “without gluten” are all terms that can be included on the label if the product has less than 20 parts per million of gluten, the U.S. Food and Drug Administration reports. If you don’t see these terms, you might want to select another variety. Is There Gluten in Tortilla Chips?